Growing and maintaining a reef tank can at first seem difficult. There are lots of things to consider and more questions come up as newbies begging to learn and develop the aquarium skills. Knowing the basics of coral, including what to feed them given their delicate nature deserves careful consideration. Finding the best coral food isn’t hard, but it does require wading through a few options that aren’t suited for you. Coral needs a balance of nutrients like any other living creature. It’s important that you understand the food options and why one is better for your tank than another option. We’ve gathered the top five that are available on the internet! Take careful consideration to determine which option is best for you and your reef tank! If you are a new aquarium enthusiast, you might wonder what exactly does coral eat? The short answer is that they eat plankton. The full answer is a bit more complicated, however many companies that specialize in aquatic pet food have built up nutrient-dense options. These options are available so you don’t have to go through all the scientific research and construct a food choice for coral yourself. Not every aquarium owner is a marine biologist. But, if you’re looking for a greater understanding of your tank’s newest addition we’re happy to help! Most of the time coral eats phytoplankton. Phytoplankton is small, occasionally microscopic, plants or algae. In other words, they’re the floaters, drifting aimlessly through the tank. Coral will generally eat anything that is easy to catch. Sometimes this includes larvae or floating plankton that doesn’t settle the way that phytoplankton does. Zooplankton is occasionally taken in by the more aggressive corals. The large polyp stony doesn’t have any issue grabbing onto this type of plankton. One plankton type that is important to coral for its nutrients is bacterioplankton. This is also referred to as reef snow. All of these can stimulate the coral to know that it’s chow time. This goes back to coral’s roots because in the ocean these triggers occur naturally and signify an increase in plankton in the area. Plankton usually comes out when the light fades, so when it is dark the coral opens its polyps to begin taking in any plankton that wanders by. A barb kills any plankton that it comes into contact with and then little tentacles pull it into the coral’s mouth. The coral uses stingers to draw food into them, which work similarly to jellyfish or sea anemones. Their tentacles can be microscopic, and hide inside the coral skeleton through the day. Because they rely on stimulation of light to know when to feed and when not to, they’ve begun adapting to aquarium habitats. From the info above you’ve probably already figured out that feeding coral is not as easy as feeding fish. The different type of coral requires some special treatment. The time you spend getting to know your tank will help you understand which options are best for you. There are two methods to use when feeding coral. With your coral food and the pump on your tank, you dispel the coral’s food throughout your tank. The stirred up water spreads the food throughout the tank in an even layer. Many experienced aquarium enthusiasts prefer this method because it also nourishes the fish. By mixing the coral’s food throughout the entirety of the tank everything in it has the chance to benefit. Whenever you are using the broadcast feeding method be sure to use not only the right food but also, the right amount. Because there is less control here, any food that goes uneaten will cause your tank’s nitrate levels to increase. Using a syringe, you hand deliver the perfect blend of food for your coral. The plankton is delivered within reach of the coral’s barbs and the coral has an effortless meal. Aquarium enthusiasts use this method to preserve the health of their water longer. The water appears clearer with this method also because there isn’t the excess plankton floating around. Finding the best coral food is about more than just the coral but also feeding fish and plants. Because their food affects the entire tank you have to consider the health of the overall aquarium. Using the right feeding method with the best food for you will help your coral thrive and nourish the rest of the tank. The two common types of coral share a number of similarities, however, the few differences are major. The differences between the small and large polyp stony are what will direct which food is best for them and your tank. While the large polyp stony or LPS are known for stinging and their aggressive nature, small polyp stony varieties or SPS are recognized by their flowery appearance. The nutrients each need are essentially the same. However, the feeding method can severely affect them. For LPS, the preferred method is target feeding. This ensures that each coral is getting nutrients and not being killed by its neighbor. While the SPS corals aren’t aggressive and the whole tank can benefit from the broadcast feeding method. Take both of these into consideration when choosing which food is best for you. These are the top picks for the best coral food available. Use these, your preferred feeding method, and the rest of your tank to consider which is the best for you! This is a great option for a new aquarium setup because it gives the whole environment a boost. It’s usually used for seeding. It is comprised of small crustaceans called copepods that are great for picky eaters in the reef. The copepods reproduce naturally and are rich in omega-3 fatty acids and amino acids. Both the Tisbebiminiensis and the TigriopusCalifornicus help clean your tank. They both reproduce naturally in different ways delivering two methods of cleansing for your tank. The tigriopusCalifornicus will help maintain your tank’s health once they are mature. However, the TisbeBiminiensis help your tank because they live in the small cracks throughout the tank. This keeps your fish and coral searching into these cracks for food. Your coral is fed and entertained. The concept is great, a package of copepods that will not only feed your coral but reproduce for a continued food source and a cleaner tank. Unfortunately when it comes to this product the mix of adults and juveniles mean that many of the copepods are dead or near death. This is a great product for anyone who is looking to seed a new tank as you are already closely watching the nitrogen levels. This product is supposed to replicate the coral snow mentioned earlier. It simulates the biogenic matter which naturally exists in seawater. 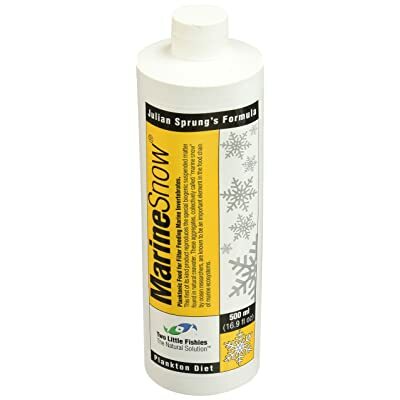 Because it’s such an important part of the marine food chain many aquarium enthusiasts use this product, as it’s the only one which attempts to achieve the natural effect of biogenic matter. Coral, known for feeding on phytoplankton and zooplankton can get the nutrients it needs from Marine Snow. Many aquarium enthusiasts use the broadcast feeding method, but if you have aggressive LPS you can also syringe feed it to your coral. If you see any excess pooled on the top layer of your tank, allow your pump to naturally disperse it. The appeal of the Two Little Fishes Marine Snow is that it attempts to replicate the natural food chain with great success. Although the coral in your tank will naturally receive fish waste, it won’t nearly be in the volume the coral would receive in the ocean. Reefs are notorious for having very diverse and dense populations. Unless your tank resembles this very closely you need some help in the nutrients area. The downside is that the formula gets thick when kept in the refrigerator. When you’re ready to feed your coral, remove the food from the refrigerator for a few minutes and shake it vigorously! This is a balance of carbohydrates, lipids, and proteins meant for your coral. It uses its unique formula to deliver a simulated ocean experience. Not only is it great for corals, but many aquarium enthusiasts find that it benefits their scallops, sponges, and clams as well. This is an option that addresses the entire bottom layer of your tank. Because the formula is so complex, it isn’t likely to do any good for your fish. 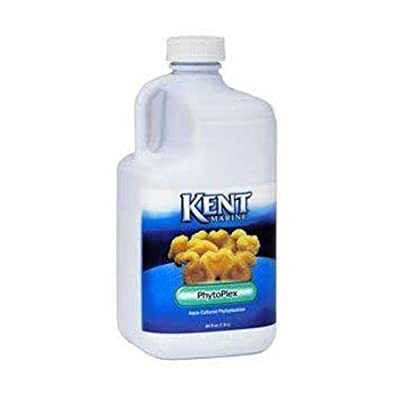 The best option if you’re using Kent Marine PhytoPlex is to target feed your coral. That way the coral has the immediate dosage. This formula does not circulate through a tank very well. So, if you do want to use the broadcast method it’s best to feed it into a high current. This is where many new reef owners start. Because the formula is easy to use and easy for broadcast feeding it is a newbie favorite. The downside is that because the phytoplankton isn’t live there is no chance of seeding or reproduction. Keep in mind you’ll be using this product regularly. This self-proclaimed “ultimate coral food” doesn’t just feed coral. The formula is made to give nutrition for everything in your tank. Small fish, LPS, SPS, scallops, crustaceans and more can benefit from Coral Frenzy. 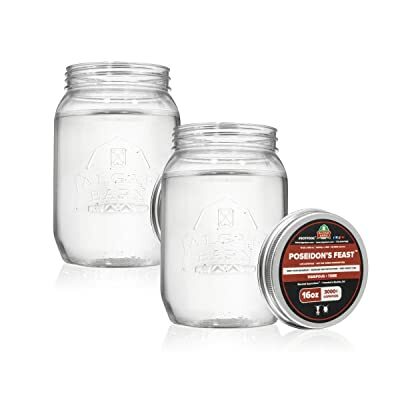 This is great for newbies who don’t know what to put in their tank for coral, and its great for experienced aquarium enthusiasts who don’t want to put in the work. Not having the discipline or time available to worry about frozen food, or keeping up a live food stock in your reef tank is no reason to avoid coral. Coral Frenzy has phytoplankton and zooplankton. While the zooplankton is busy at work feeding your coral, the phytoplankton is feeding the microfauna that will continue to feed your coral long after the zooplankton is gone. There aren’t hidden ingredients or filler, unlike other coral foods, everything in the container is printed on the side too. Combination of roe, copepods, and larvae. There isn’t anything about Coral Frenzy that stuck out as negative. Everything in it is beneficial for either your coral or another living creature. Overall, this is a quality product that is enjoyed by newbies and experienced coral owners. The only downside is that this delivers so much, and so easily that a number of aquarium owners don’t enjoy using it. If you love putting time and effort into maintaining your tank, this isn’t the right food for you. 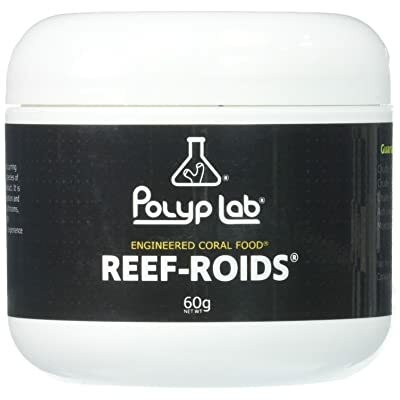 This specially formulated coral food is meant to protect your water from any degradation. This product is highly rated mostly because it stimulates a noticeable response and polyp extension. Although you can broadcast feed, by dispersing it into a high flow water column. But, target feeding is recommended for this food. Using a syringe this is a great food option for aggressive corals. Overall it’s meant for normal use and isn’t meant to build a reproducing plankton colony. If you enjoy regularly target feeding your coral this is a great option. It is also packed with only naturally occurring materials and has a combination of plankton which makes this a well-rounded choice for your tank! 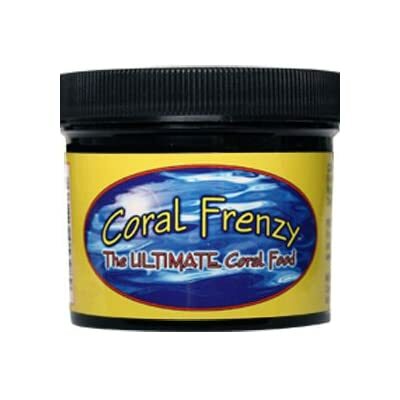 Coral Frenzy really does deliver as “The ultimate coral food” because it delivers so much more than just food for your coral. It really provides a substantial amount of nutrients for everything in the tank. This doesn’t just mean that your coral is getting a wide range of nutrients. It also means that any extra food floating around is more likely to be eaten by other organisms in the tank. With everything in your tank being interested in Coral Frenzy your nitrate levels should stay maintained which is what really moved Coral Frenzy into the top spot!